“It’s next week, I tell you!” I told P. looking at the calendar hanging by the kitchen door. This is really the way we feel this year. Christmas next week? I don’t think we have been as little prepared for Christmas as we have this year. Preparing for bébé‘s arrival has taken every bit of our energy and time — and thoughts. Take for example the following: I am unable to remember where I put things, sometimes even the point of a conversation, stopping myself in the middle of a sentence. With food, though, things seem to have stayed somewhat on track, at least consistent. I don’t forget to prepare food, and to eat — quite on the contrary. I did not think much about it at first, but I have even started to freeze some dishes to keep us going during the first days we will spend with bébé. Then, food ideas have kept flooding my mind too, making me wish I had more time, and ability to eat, the many things I really want to cook. I made these amuse-bouches for example, for one of the videos kindly shot by the people at How2Heroes. Ah..oh…yes, please, be indulgent, it’s my first cooking video experience — with, on top, a pregnant woman’s brain. These potato nests are filled with flavors. They are light and refreshing, wonderful before starting a festive meal. In only one mouthful, you can taste crispy potatoes with a finish made of fried leeks, sweet and juicy apple and pomegranate, silky crème fraiche, and refreshing crab. The bonus? All the steps can be made ahead of time, and assembled at the last minute. They will be on the menu for our Christmas, should we be home that day – unless bébé decides to arrive then, and feast with us. Well, we shall see about that. In the meantime, I ate these treats this afternoon. Excellent as a snack for a gourmande pregnant woman! Preheat your oven at 420 F (210 C). In a bowl, combine the grated potatoes with the egg and nutmeg. Add the parsley and season with salt and red peppercorns (or black pepper). Take a mini muffin pan (I used a silicone one, all molds are 1.5 inch) and grease it with cooking spray. Take a small amount of the grated potatoes in your hands. Squeeze out the excess juice and press it down at the bottom of each mold, to make a nest. Add 1/2 teaspoon butter in each mold. Cook for 25 minutes, or until brown. Remove, unmold and let cool. In the meantime, in another bowl, combine the crab with the apple and lime juice. Add the olive oil, coriander, scallions and chives. Season with salt and pepper. 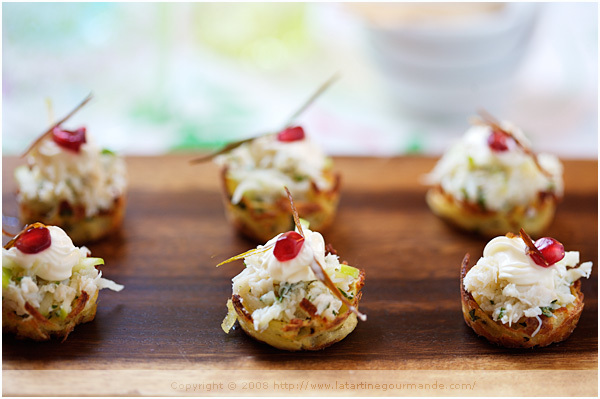 Fill each potato nest with the crab preparation and add a drop of crème fraiche on top. Top with a few pomegranate seeds. Decorate with chives or fried leeks. Préchauffez le four à 210 C.
Dans une jatte, mélangez les pommes de terre râpées avec l’oeuf et la muscade. Ajoutez le persil et assaisonnez de sel et de baies roses concassées ou de poivre noir. Graissez un moule à mini muffins (chaque petit moule mesure 4 cm) (le mien est en silicone). Pressez l’équivalent d’une petite cuiller de pommes de terre au fond de chaque moule de façon à fomer un petit nid, en vous assurant d’enlever l’excédent de liquide (pressez les pommes de terre entre vos doigts). Ajoutez une 1/2 càc de beurre fondu sur chaque nid. Cuisez pendant environ 25 minutes, ou jusqu’à ce que les pommes de terres soient bien dorées. Retirez du four, démoulez et laissez refroidir. Pendant ce temps, dans un autre bol, mélangez le crabe, la pomme, le jus de citron vert. Ajoutez l’huile d’olive, l’oignon tige, la ciboulette, la coriandre. Assaisonnez de sel et de poivre. Remplissez chaque nid de pommes de terre avec cette préparation au crabe. Ajoutez un peu de crème fraiche et une ou plusieurs graines de grenade. Décorez avec un brin de ciboulette, ou du poireau frit. beautiful bea. you are so close… enjoy the rest of the time and congratulations again! Wow! Super video can’t wait to see more, you’re a natural! Stunning! You are such an artist Bea! these look gorgeous! enjoy the holidays! These look beautiful. Here’s to a happy holiday and a healthy baby! Great video Bea!! I think I would have frozen and become mute!! Very cool video! Was nice to see uo in action. These looks so cute. I love crab and apple. This will be served on my next party. Thanks Bea. Love the recipe and your video — you are a pleasure! 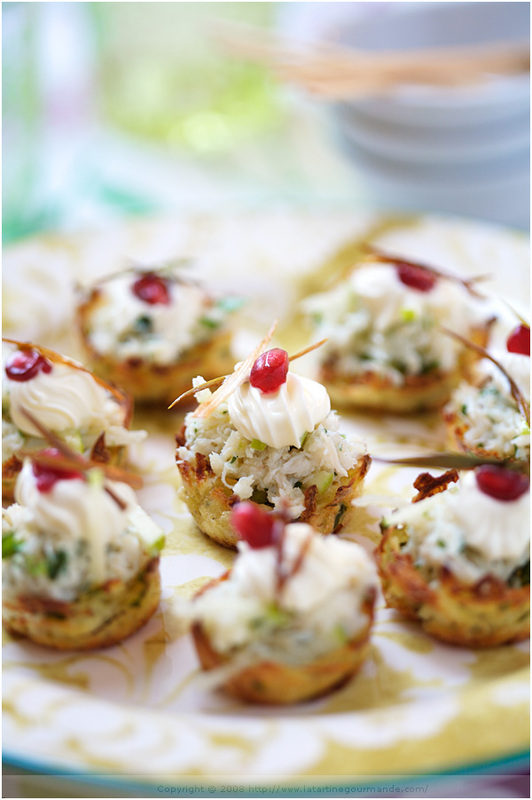 Time passes really fast… Those Amuse-Bouche look delightful! Très original! Ta recette est parfaite pour les apéros prochain que l’on veut chaque année plus beaux! It really has come up fast this year. I can not believe that Christmas is in 7 days! PS – the video is really nice. You did great! pas etonnant que les anglophones craquent pr notre accent …. Super cette video ! bonne continuation ! The recipe and the photos are just beautiful, as usual.. so no wonder about it. It was really nice watching the video, it was a little bit like meeting you. So thanks for that, you’re a pleasure for eyes and ears! All the best to you and bébé! I have never had the crab and apple combination, it sounds and looks wonderful. I have a notorious short term memory at the best of times. J’en prends quelques-uns immédiatement et je te pique la recette! Bonne chance pour l’arrivée de Bébé et un merveilleux Noël aux heureux futurs parents! brilliant! thank you! Merry Christmas! You did a great job on the video! I did a cooking video for the first time this past August…so funny! It’s now a family classic. I made a very similar recipe last week for my Xmas party and it was a hit. The toppings were less elabotated, since I wanted to make a quick thing, but I loved it. Good luck with bebe! Great videos Béa! Look out Rachel Ray! I see you use Herbamare as a salt substitute. It is a staple in our house as well. Yes, Christmas has crept up on us this year too. I’m only just now planning our menu for the big day. Can’t wait to hear news of the bébé. une idée raffinée et relativement simple, je prends! Can’t wait to try the vanilla pots de creme! They look delicious and festive! I love your how-to video et encore plus, j’adore votre accent! Bea, if the baby decides to arrive on December 25, then we’ll share the same birthday!! Let us know, ok!! Promise!! And if I don’t “see” you again until after Christmas, Joyeux Noel, and enjoy yourselves with bebe!! Absolutely gorgeous!!! Your food is to die for and your photography is amazing! I could only hope to style and shoot like you. Love, love your video! I hope to see you on TV soon! Wonderful idea. If I try this recipe, ill have to either substitute or omit the crab. How exciting that the baby is going to arrive soon! All the very best. great job on the video, Bea, it’s nice to see you in action! bea, loved the video congratulations. i will be on the look out for more.merry xmas! J’adore tes petites bouchées au crabe et encore si je pouvais les manger ! Béa, you have got really nifty hands! I’ve just made 12 amuse-bouche — facile! Easy to watch and follow you on How2Heroes. Perfect fit for crab — so tasty! Saving 6 ..Merci and Congratulations! I made these for my husband’s birthday party yesterday and they were a total success. I barely managed to taste them (only two) as my guests could not have enough of them. They go really well with champagne! Thank you for this beautiful, yummy hors d’oeuvre. I made these this weekend for a small gathering and was surprised how easy they are. The potato nests were a bit soft — I expected them to be a bit crunchier. The filling was tasty but the flavors were a bit too subtle. Next time, I’ll amp up the lime juice and the salt and pepper. Both both halves of the recipe are great to know about for future reference — I’m thinking about making larger potato nests to cradle vegetables for a summer buffet and the crab could easily stuff small tomatoes for a picnic.